Who ripped out the beating heart of “Community”? Alas I celebrated a little to prematurely about Community being renewed for a 13 episode fourth season. For while one of the most innovative and clever sitcoms on television is back for another season, it will be without it’s creative heart and soul, Dan Harmon, who created the hilarious boundary-pushing masterpiece in the first piece. Amid reports of behind-the-scenes tensions between Harmon and one of the show’s stars, Chevy Chase, and creative differences between NBC/Sony and Dan Harmon, executive producer and show runner of Community has been shown the door in the most public of ways. According to reports, they failed to contact him directly, leaving him to learn his fate along with the rest of us. “They literally haven’t called me since the season four pickup, so their reasons for replacing me are clearly none of my business,” Harmon wrote on his blog. 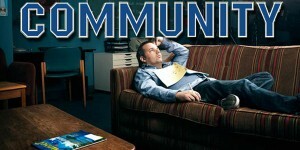 Reportedly this was due to Dan Harmon’s unwillingness to sacrifice Community‘s idiosyncratic story lines in favour of ones with more mainstream appeal, and you can only surmise that the people handpicked by Sony to helm the sitcom, Happy Ending‘s Moses Port, and David Guarascio are much more inclined to do their master’s bidding than was Harmon. Even if they do turn out to have minds of their own, Community can’t help but be a different sitcom entirely without Dan Harmon’s unique comic imagination. While Happy Endings is a funny show, it lacks the spirited sense of intelligent writing that marked Harmon’s now all too brief reign. Harmon was willing to centre an entire episode around mock documentaries on blanket forts, play with multiple timelines during, of all things, a Yahtzee game, and turn paintball games into homages to spaghetti westerns or sci-fi space operas. Many other people are, and they, like me, are devastated by the news. 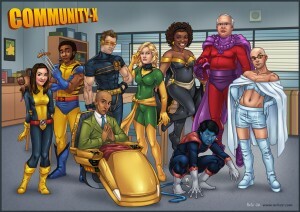 While I want to believe that the new team will adhere to the inspired insanity of Community up to this point, all signs point to a new more compliant regime that will turn the show into something more appealing to Joe Average, which means a lot of what it truly unique will be lost. Here’s Community’s Gillian Jacobs, Ken Jeong & Yvette Nicole Brown, with the now departed Dam Hamon at WonderCon 2012 Panel in March.